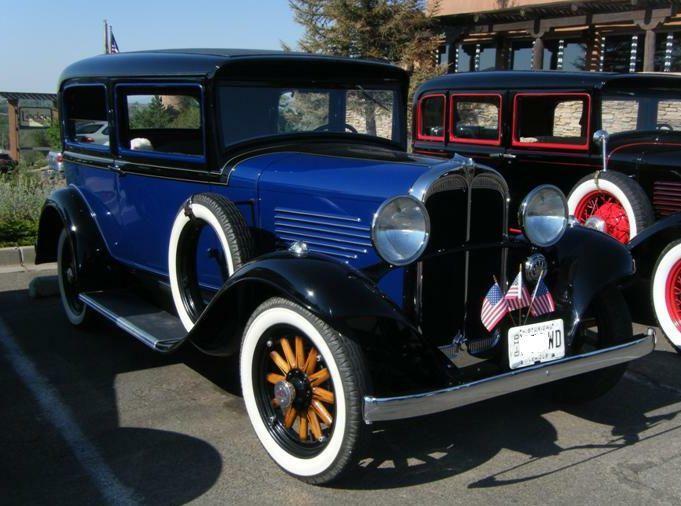 Thanks to members for identifying a mystery car owned by my maternal grandfather, back in the 1920's or 30's. I have another picture of a different car that I would like to identify. The picture is not nearly as full of information as the first picture was, so I am hopeful but somewhat doubtful there will be a conclusive identification. My grandfather and grandmother are standing in front of their car in the driveway of the house they lived in at the time. (A stone house built around 1880, I can use Google Streetview to see where in the driveway they were standing when the picture was taken.) My grandmother is casting a noon-ish shadow over the car. Most of the key details are not visible, but perhaps there is something here for someone to latch onto. Things I noticed were... the straightness of the black crossbar for the headlights, the way that bar curves to the fender; the way the wiper comes out of the front window frame; the position of the headlight, something of the pattern in the lens; the position of the horn and its shape and size; the way the grille is recessed across the top, the lack of chrome in the central part of the grille, what might be a homemade grille cover (a trick I, myself, have used in Northern Ontario); the Ford-like curved bumper; and lastly the bottom of the grille where it looks like there are grooves in the casting. The pics I can offer are... a cropping from the original, an enlargement of the cropping, a snip from a pic I found that may have similar grooves like this grille seems to have, and a drawing I made that is what I imagine the car front might look like in its entirety. This side of the family was not as well off as the other. The car may have been older, second hand, or no longer stock. The bumper looks a bit rough. Their first car was a 1929 Durant. There were five kids, so I thought four door (like the Durant was), but I cannot see a second window down the side. My grandfather was said to have never owned a Ford, but this may not be true. He worked for the Grand Trunk Railway (GTR) before it became Canadian National (CN). Before that he was a delivery man - this could be a truck. Any thoughts or leads are appreciated. Thanks, keiser31, but I think this one has grooves in the bottom of the grille that extend completely up it instead of just what looks to be a 2" portion with solid metal below. The colour pic I provided is similar to what you have found and is different in the same way. I can add something, a closeup of the door hinge area. I think I only see one hinge and it does seem to be in the right place for a normally opening front door (not a "suicide door"). If you count back through the verticals, I see the slightly curved side of the window that opens frontward, the leading edge of the windshield pillar, then the upright of the window pillar (the door hinge on it), then there must be the rear vertical of the front door, then nothing distinctive after that. The front contour of the roof is more plainly visible in this pic also. This is a cropped pic of the kind of bumper it might have. This is a Ford bumper and they usually look like they have two horizontal pieces, rather than the solid-looking bumper in the original pic. 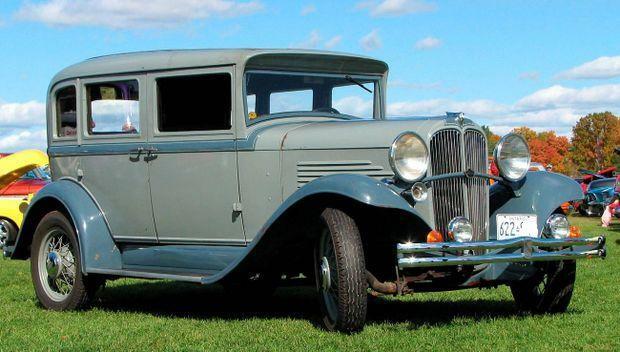 The vehicle appears to have an overhanging roof at front (instead of an add-on sun visor) common for some cars of the late 1920's, Nash, Peerless etc. Radiator shell appears wider at bottom than top. And the pleated bottom part of rad should be a clue. 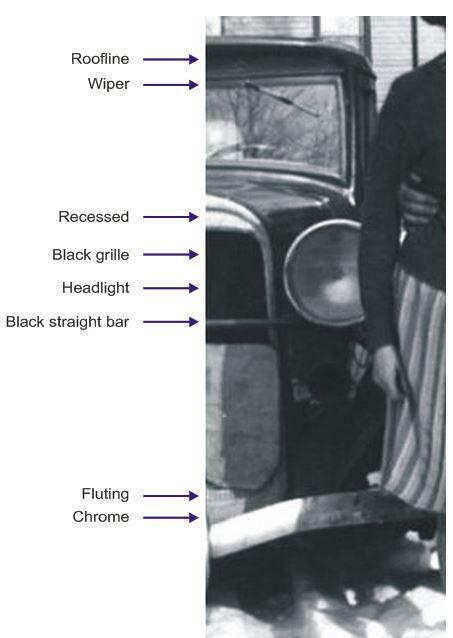 I think bumper is a distraction, likely from circa 1933/34 car of some make, several models/makes used that dropped V front bumper. The "winter cover" on radiator suggests cold weather car. The heavy reveal at top of rad shell should also help narrow the options. Definitely NOT Pontiac of any year. They never had a visible metal frame around the windshield. Their metal frame was black and hidden in the rubber seal and went up and down as the window was crenked up or down. Willys Whippet with another make front bumper? Not a bad match, looks like same grille shape and feature, same wiper location, it might also have the same headlight lens pattern. This is one I looked at, I will look further. 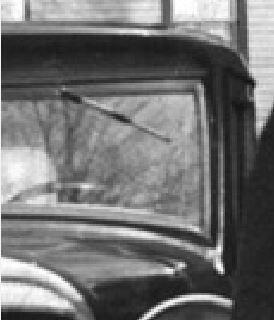 Another snip from a pic of a Toronto-made Willys, that's just over an hour from where my grandparents lived at the time of the original photo. They also lived in Toronto a few years earlier. My Dad would walk to go swimming at Sunnyside as a kid (for anyone who knows Toronto history). 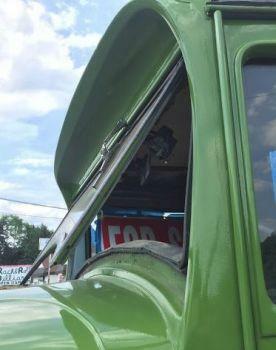 This one shows the same roof line over the windshield, wiper in the right place, and there are no door hinges to see. Maybe what I thought I could see wasn't there. Maybe the top of the grille just flows back, no recess. The drip line above the doors looks correct, too. Looks more right, 58L-Y8, with a different bumper, as you say. But no pic yet with it all in place. Not bad, though. The Grey with blue stripe is correct car. You noted it has no exposed top hinge, same as your original photo. It has a unique roofline I've never seen before. 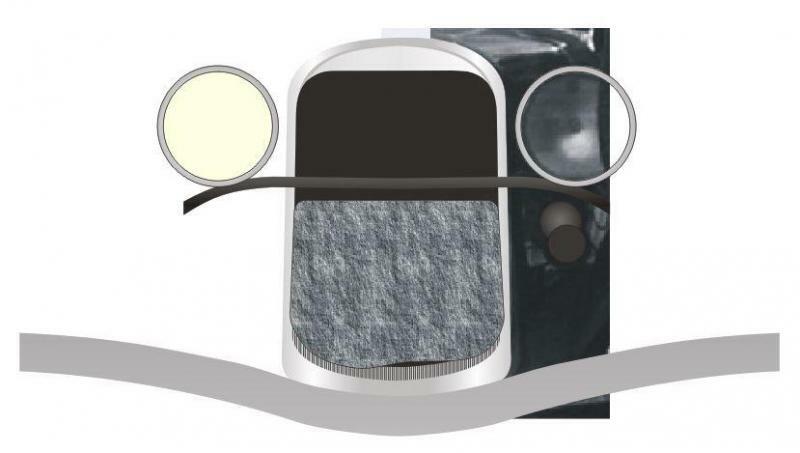 The Grey with blue stripe car picture came from an article about that car in the Toronto newspaper The Globe and Mail. 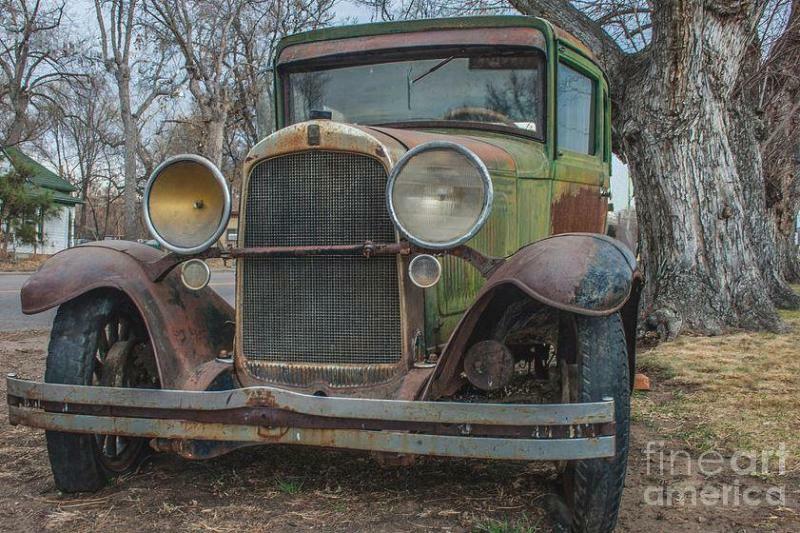 The car in the article is a 1932 Willys Model C90. There may be a closer match out there for some of the front end things, so I am going to look and learn about Willys. Period ad: "designed and built for those Canadians who want the finest." I found this interesting... By 1943, "the company developed the vehicle that became its enduring legacy: the Jeep." 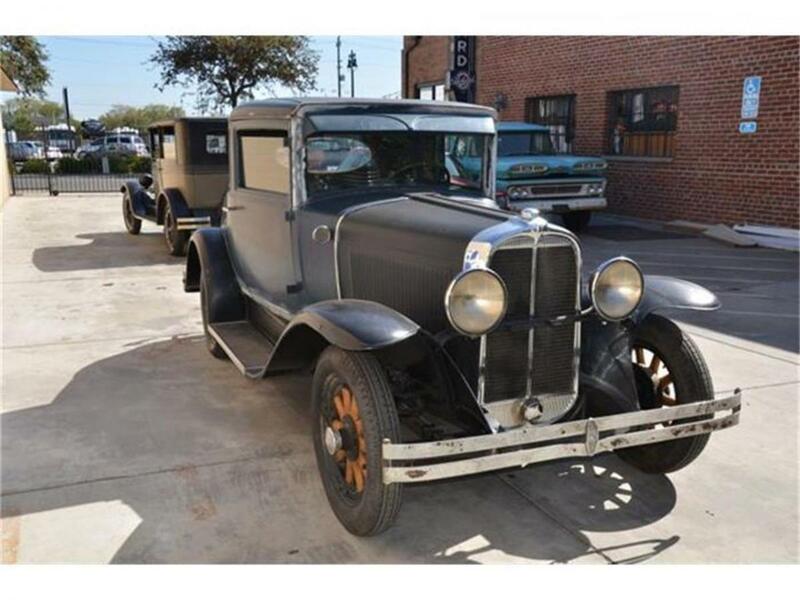 I'm thinking my grandfather might have possibly traded in his '29 Durant for a used one of something like this. Thanks, DM, your pic has a perspective that makes it easier to compare. The slight curve in the sides of the windshield are visible, not presumed. Do you know what model this one was? Google search couldn't find a match for your pic. For anyone who may not know, Google can search for pictures and can sometimes find matches. In Google Chrome, right-click on any visible image on a web page and choose "Search Google for image". If Google finds a match, it will offer whatever sizes it finds (helpful if you want a pic of higher or lower resolution). If it doesn't find a match, Google will offer "Visually similar images". A handy extension of this ability is if you want to search the Internet for a picture you have on your own computer, not one you have come across and are viewing on the Web. Open any picture you have with Chrome then right-click on it and "Search Google for image". 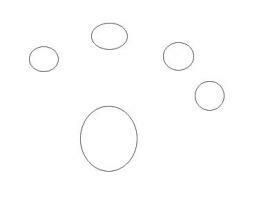 You will either find the image or be offered the "visually similar". To open an image in Chrome, simply drag the image onto any web page - Chrome will open the image in place of the page you are viewing. (If you don't want to lose the page you are viewing, open a new page then drag-and-drop. This is what Google retrieved as visually similar to DM's pic. If you click on this cropped image from the retrieval page, you can see what else Google offered as matches (I embedded a link). And you aren't limited to using an entire picture. I cropped the license plate from DM's image and did a search for that. Google's analysis and search retrieved this. It figured out the image was of a licence plate. The image came right from Google. type 1931 Willys on your tool bar then hit "images". you'll scroll down through a few "show more images" and come to this one. This link is for the "view page". It says Model 97 but I think it's an Overland. It's not a Knight or a Whippet. I found a similar one with a number of pictures from various angles. 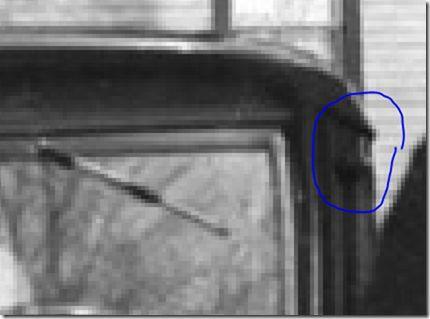 I snipped from one that shows what's above the front window, window open.